Personalised stylish black bath towel, a unique and useful gift in ever popular black. Personalised stylish black bath towel, a unique and useful gift in ever popular black. Treat a special person to a unique gift. Popular for birthdays, wedding or anniversary gifts and even a great housewarming gift. Personalised stylish black bath towel, a unique and useful gift in ever popular black. Treat a special person to a unique gift. Popular for birthdays, wedding or anniversary gifts and even a great housewarming gift. This bath sized towel is soft cotton. 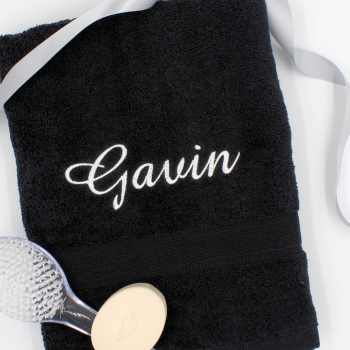 You can fill in the option box and have this towel made extra special - personalised with your choice of text, including His, Hers, or a name embroidered or initials monogrammed on in a fancy coordinating thread.